Cairo to Cape Town: To Zim or not to Zim? To Zim or not to Zim? One of my secret desires for the trip is that the situation in Zimbabwe stabilises sufficiently and in time for us to enter the country. Visiting Zim as it emerges from a prolonged period of self-inflicted chaos (Christopher Hitchens’s recent piece is worth a read) would be exhilarating. Based on the latest news, however, I’m not holding my breath. Mugabe has, seemingly from a position of weakness, wrong-footed the MDC by engineering a run-off election as well as by deploying his usual cocktail of dirty tricks, guile and preying on the weak. International/regional inaction and MDC indecision haven't helped. The MDC’s chances cannot be considered good. If Zimbabwe’s situation were, however, to improve, our route would see us shoot down Zim’s western highway from Vic Falls to Bulawayo. Once in Bulawayo, we would head west and join up with our route through south eastern Botswana and, if time permits, backtrack a little to ensure we experience the Kalahari proper. I lived in Zim for the better part of a year over 2001-02 (including during the previous presidential election in March 2002) when things were, while not exactly good at least relatively stable. Bread and petrol were available in the shops and inflation was only around 100 per cent. In retrospect, that stability seems barely skin deep; nor would stablility have been the adjective of choice for average Zimbabweans describing their lives. But it is true that in the intervening years Mugabe’s regime has done a lot to worsen the situation (like this, this and this). As part of my work for the International Red Cross I visited Bulawayo a handful of times and always marvelled at the wide boulevards, fine urban planning and distinct Ndebele culture. In all my travels one of the biggest ever disappointments was failing to visit Victoria Falls during that year. In any case, we will certainly rectify that omission in August (from the Zambian side at a minimum), but it sure would be nice to witness Zimbabwe as it enters a new period of hope. Given its historical experience and current characteristics, Bulawayo would surely be the epicentre of a Zimbabwean recovery. Wishful thinking… perhaps. Speaking of complicated places to visit… Does anyone have any up to date information for Canadians seeking to get Sudanese transit/tourism visas? We’d really appreciate any advice or information folks may have. Thanks! Posted by Sam Millar at 8:18 a.m.
Good luck on your trip. 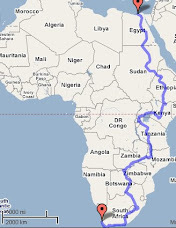 We are planning to catch the Ferry from Aswan, Egypt to Wadi Halfa, Sudan on July 7th, so we might cross paths in Egypt. We just got our visas for Sudan today. We contacted the owners of Bougainvilla Guesthouse in Khartoum http://bougainvillaguesthouse.com/ and they have been incredibly helpful. They are a Finnish couple who are fluent in English and have kindly sponsored our visa application by having their lawyer present our case to the foreign minister, who then sent approval to the Sudan Embassy in Ottawa. Good luck with the paperwork, and see you in Africa. PS - my email address is tysonbrust@yahoo.com. May 6, 2008 at 11:50 p.m.